Because we believe that art can transform individuals and communities, our mission is to stimulate research, support artistic practice, and generate original programming through the Art, Design & Architecture Museum’s collections. In a serene setting alongside a Pacific lagoon, the Art, Design & Architecture Museum at the University of California, Santa Barbara provides intimate access to art. 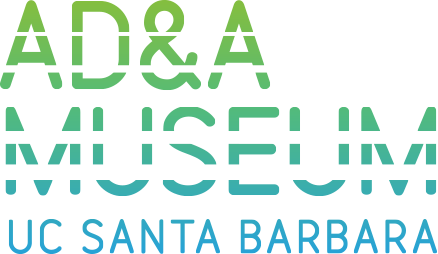 Through rotating installations of its permanent collections along with special exhibitions and programs, the AD&A Museum is both a teaching museum, committed to the development of critical thinking and visual literacy in support of the University’s goals of education, research, and service, and a resource for the wider Santa Barbara community. The AD&A Museum’s Fine Arts collection includes the Morgenroth Collection of Renaissance Medals and Plaquettes, the Sedgwick Collection of Old Master Paintings, the Feitelson Collection of Old Master Drawings, the Ken Trevey Collection of American Realist Prints, the Fernand Lungren Collection, and a growing collection of contemporary artwork in all media. Contemporary holdings focus on artists active in California, particularly in the Santa Barbara community. The AD&A Museum also features significant holdings in photography, including an extensive collection of vintage daguerreotypes, tintypes and ambrotypes from 1840-1880 as well as works by Muybridge, Weegee, William Wegman, Gary Winogrand, and Carrie Mae Weems. In addition, the art collection is strong in ethnographic objects. The jewel in the crown of the AD&A Museum’s holdings is the Architecture and Design Collection (ADC), one of the largest and finest architecture and design archives in North America. The ADC is essential for studying the built environment of Southern California from the late 19th- through the mid-20th­centuries and includes the work of such renowned architects as Albert Frey, Irving Gill, Cliff May, Rudolph M. Schindler, and Kem Weber, among others. Of particular regional interest are the archives of George Washington Smith and Lutah Maria Riggs. Mirroring the diverse cultures that have informed the maturity of the West, archival items range from nineteenth- and twentieth-century historical revival architecture to modernist designs, including the impact of industrialization and technology on design and construction. While the Art, Design & Architecture Museum serves the entire campus and local community, it operates under the auspices of the College of Letters & Science, the largest center of teaching, learning and research at University of California, Santa Barbara. We encourage you to learn more about the College and the vibrant academic community it fosters. Visit the College of Letters & Science web site.